McMillen Yachts Inc. was founded by Atlanta, Georgia native Earl McMillen III in 1992 following six years of extensive hands on classic yacht restoration. The purpose of the company was to restore and maintain classic yachts. In 1995, McMillen pioneered the concept of fractional yacht ownership in an effort to allow other people, with a similar interest and less available time, to participate in the same goal. To date, McMillen Yachts has restored dozens of significant yachts and in the process has built the finest collection of classic American yachts in the world. Today, with their office in Newport, Rhode Island, McMillen Yachts is able to offer year round use of the yachts in the “fractionally owned” fleet anywhere along the coast of the eastern United States. During the summer months, the fleet bases out of Newport and cruises between New York and Maine. In the Spring and Fall, the boats cruise the Georgia/South Carolina coasts; and in the winter months they are based in south Florida and cruise both coasts, including the Florida Keys and Bahamas. Our founder, Earl McMillen III, graduated with a degree in history from Columbia University and is passionate about restoration and historic preservation. He is an Emeritus Board Member at the International Yacht Restoration School, in Newport. Earl also serves on the board of the historic Redwood Library in Newport and the Middleton Place Foundation in Charleston, South Carolina. 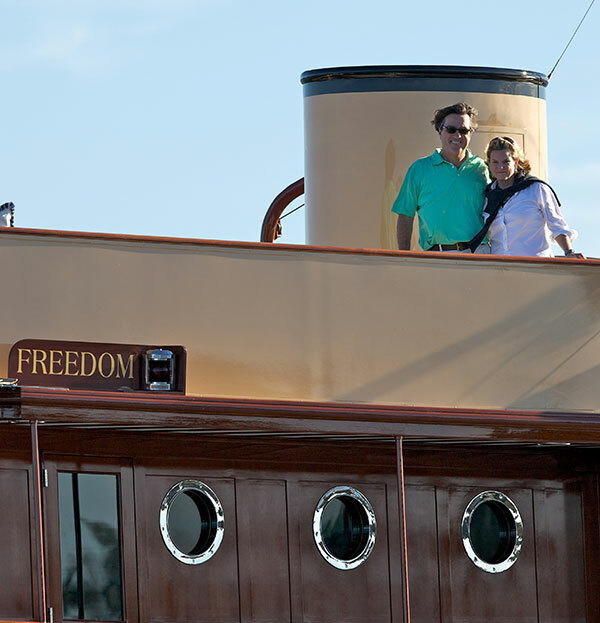 In addition to restoring yachts, Earl and his wife Elizabeth share a love of historic preservation and have restored and lived in numerous historic houses in Newport. Elizabeth is active in the business and oversees the responsibilities of interior design and crew training. She is a graduate of Hollins College, majoring in Art History and worked in New York as a buyer for Gucci & Bergdorf Goodman. She managed the Lexington Avenue shop for NYC decorator Charlotte Moss and later took a American Arts course at Sotheby's. The McMillen’s consider themselves very fortunate to have working with them an extraordinary team of committed and talented artisans who have devoted their lives and careers to this worthy cause!